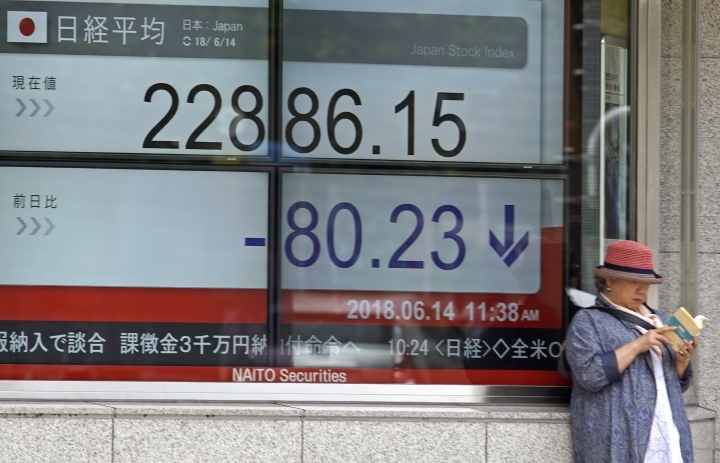 SEOUL, South Korea — Global stocks slumped Thursday after the U.S. Federal Reserve raised its key interest rate and said it would pick up the pace of future increases. Eyes are now on the European Central Bank, which is discussing Thursday when it might end its stimulus program. KEEPING SCORE: Britain's FTSE 100 was down 0.5 percent to 7,667 and France's CAC 40 fell 0.2 percent to 5,441. Germany's DAX was down 0.3 percent to 12,846. Futures indicated a lackluster start on Wall Street. Futures for the Standard & Poor's 500 index and Dow were flat. 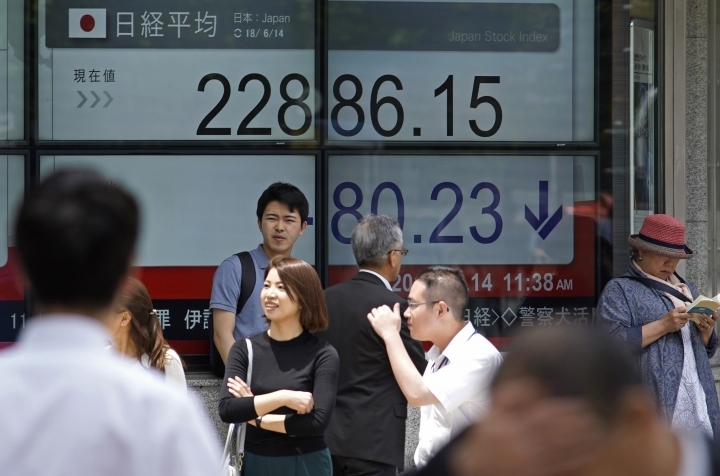 ASIA'S DAY: Japan's Nikkei 225 sank 1 percent to 22,738.61 while South Korea's Kospi plunged 1.8 percent 2,423.48. Hong Kong's Hang Seng index dropped 0.9 percent to 30,440.17 and the Shanghai Composite Index was down 0.2 percent to 3,044.16. Australia's S&P-ASX 200 slipped 0.1 percent to 6,016.60. 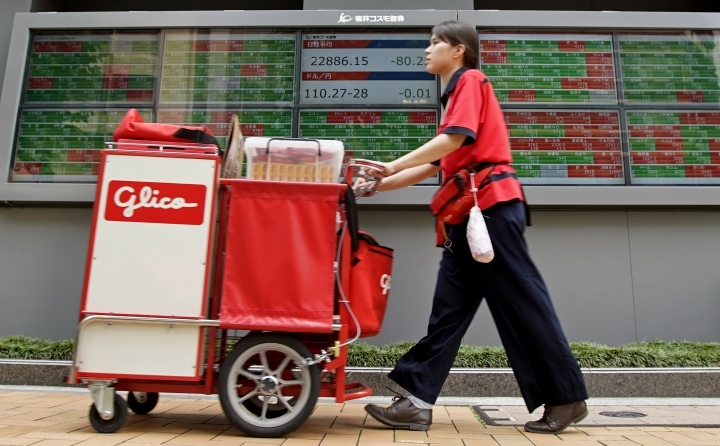 Stocks in Taiwan and Southeast Asia were lower. CENTRAL BANKS: The Fed's rate hike was its second this year. The American central bank raised its outlook for increases this year from three to four. Chairman Jerome Powell said the U.S. economy is in great shape but investors worry faster rate hikes could stifle growth. The ECB, meanwhile, could indicate Thursday when it will wrap up its bond-buying stimulus program, which has boosted stocks and growth since it started in 2015. KOREA TALKS: South Korean investors sold stocks after President Donald Trump's meeting with North Korean leader Kim Jong Un on Tuesday. Trump boasted the meeting ended any nuclear threat from North Korea, and South Korean President Moon Jae-in tried to put a positive spin on the outcome, but it produced no details on how or when North Korea's nuclear weapons might be eliminated or even reduced. South Korean businesses that have recently gained on expectations for joint inter-Korean business projects were among the biggest losers. 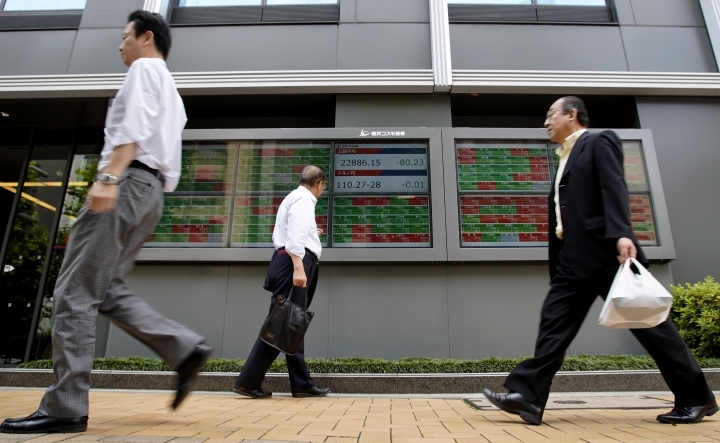 CURRENCIES: The dollar slipped to 110.00 yen from 110.33 yen. The euro rose to $1.1826 from $1.1793. ENERGY: Benchmark U.S. crude added 23 cents to $66.87 per barrel in electronic trading on the New York Mercantile Exchange. The contract rose 0.4 percent to $66.64 a barrel in New York on Wednesday. Brent crude, used to price international oils, fell 13 cent to $76.61 per barrel in London. It gained 1.1 percent to $76.74 per barrel on Wednesday.